We report the case of a 25-year-old man who developed Postobstructive pulmonary edema after an elective surgery of an inguinal hernia. Postobstructive pulmonary edema is a rare and severe complication of general anesthesia. Differential diagnosis includes other causes of early postoperative respiratory distress. Treatment is supportive. Identification of risk situation and compliance with anesthesia/postoperative care guidelines are the keystones of prevention. Postobstructive pulmonary edema (POPE) is a rare, life- threatening complication of general anesthesia that usually occurs in young healthy individuals. It results from strong inspiratory efforts against upper airway obstruction (UAO) causing an acute and significant drop in intrathoracic pressures leading to fluid extravasation from the vascular sector to the pulmonary interstitium and alveoli [1,2]. We report the case of a 25-year-old male admitted for elective surgery of an inguinal hernia in whom immediate postoperative period was marked by a respiratory distress secondary to pope. A 25-year-old man with no significant past medical history, notably no atopy, was admitted to our hospital for elective surgery of an inguinal hernia. The pre-anesthetic evaluation found a 180cm tall patient weighing 70kg, in American Society of Anesthesiologists grade I, without predictors of difficult intubation. Physical examination was otherwise unremarkable. Anesthesia induction was performed by intravenous Sufentanil (15μg), Propofol (200mg) and Rocuronium (50mg).The patient was easily ventilated with a Cormack-Lehane grade I on intubation. Anesthesia was maintained by 2% Sevoflurane and Sufentanil reinjection (5μg). 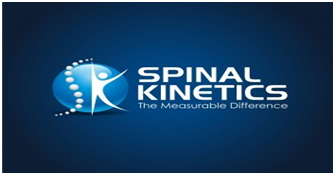 The procedure was uneventful and lasted 45 minutes during which the patient received 500ml of isotonic saline solution. Following analgesia using paracetamol (1g), ketoprofen (100mg) and nefopam (20mg), as well as the reversal of rocuronium-induced neuromuscular blockade by neostigmine (2.5mg), the patient was extubated in the operating room. A few minutes later, the patient developed desaturation (SpO2 at 70% on oxygen 10l/min) and dyspnea. Physical examination found stable hemodynamic parameters, suprasternal and subcostal retractions, diffuse bilateral crackles without any cutaneous manifestations. Reintubation was performed immediately, and pink, frothy sputum was seen in the endotracheal tube. Mechanical ventilation with 100% fraction of inspired oxygen (FiO2) and 8cm H2O positive end-expiratory pressure (peep) was initiated. A single intravenous dose of furosemide (40mg) was given. ECG and point of care transthoracic echocardiography were normal. 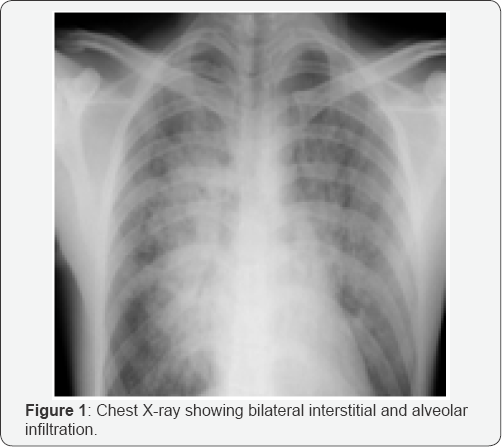 Chest X-ray found bilateral interstitial and alveolar infiltration (Figure 1). Given the unremarkable past medical history, the timeline of the events, the normal cardiac evaluation, the patent radiologic signs and the absence of cutaneous signs, a diagnosis of POPE was established. The patient was transferred to the intensive care unit where he was extubated 8 hours later with a favorable course afterward. First Described in 1973, POPE is a serious early postoperative complication, which occurs in 0.1% of all patients undergoing general anesthesia [2,3]. The primum movens is upper airway obstruction, which can be seen in different clinical scenarios such as laryngospasm (50% of cases), residual curarization, endotracheal tube or laryngeal mask airway biting, foreign bodies, recurrent laryngeal nerve paralysis, tongue falling back, epiglottitis etc. [1,4]. The pathophysiology of POPE is multifactorial. A major drop in intrathoracic pressures down to -140cmH2O, secondary to vigorous inspiratory efforts in the presence of upper airway obstruction, is the primary mechanism. Additionally, hypoxia (via increased pulmonary vascular resistance and alveolocapillary membrane alteration) and hyperadrenergic state (through blood redistribution from the venous system to the pulmonary circulation and increased pulmonary vascular resistance) are also incriminated. The end result is the development of a hydrostatic pressure gradient in the lungs, with an increase in venous return and pulmonary capillary hydrostatic pressure on the one hand, and a fall in interstitial pressure of the lungs, on the other hand, leading to pulmonary edema . Clinical presentation is classically an early acute postoperative respiratory distress. In this setting, several diagnoses must be eliminated before considering pope as the etiology, i.e., cardiogenic or neurogenic pulmonary edema, anaphylaxis, excessive vascular filling therapy and pneumonia . In our case, the unremarkable past medical history, the timeline of the events, the normal cardiac evaluation, the patent radiologic signs and the absence of cutaneous signs, were in favor of a POPE secondary to tongue falling due to "premature" extubation. Treatment is mainly supportive and comprises ensuring airway patency and adequate ventilation. Oxygen therapy with PEEP or continuous positive airway pressure (CPAP) is often sufficient. In severe cases, mechanical ventilation with PEEP and 100% FiO2 is necessary. The use of diuretics remains controversial as it can cause significant hypovolemia [2,5,6]. Favorable clinical course is to be expected once a prompt diagnosis has been made and adequate management undertaken. Prevention involves identification of risk situations (young subjects, Ear, Nose and Throat (ENT) surgery, obstructive sleep apnea syndrome, acromegaly, obesity), clearing the airway of retained blood or secretions by suctioning the oropharynx and extubation once the patient has been sufficiently awakened and curarization reversed. Preventive CPAP has also been suggested by some authors, in risk situations, as the most effective preventive measure [2,6,7]. POPE is a rare and often unrecognized etiology of postoperative respiratory distress, whose diagnosis should only be made after a thorough differential diagnosis eliminating cardiogenic and lesional pulmonary edema. Treatment is primarily supportive. Prevention of POPE is crucial and includes identification of risk situations, compliance with extubation guidelines but also active and close postoperative monitoring of susceptible patients. Aissaoui Y, Kichna H, Boughalem M, Drissi Kamili N (2012) Acute negative pressure pulmonary edema: Illustration from a unusual clinical case following a postoperative recurrent laryngeal nerve palsy. Ann Fr Anesth Reanim 31(5): 481-483. Capitanio MA, Kirkpatrick JA (1973) Obstructions of the upper airway in children as reflected on the chest radiograph. Radiology 107(1): 159-161. Aknin S, Frappart M, Berguiga R, Malinovsky JM (2014) Hemoptysia and postoperative pulmonary edema after general anesthesia for amygdalectomy. Ann Fr Anesth Reanim 33(3): 178-180. Belyamani L, Azendour H, Elhassouni A, Zidouh S, DrissiKamili N (2008) Postobstructive pulmonary oedema: Unusual complication after endotracheal extubation at the recovery of general anaesthesia. Rev Pneumol Clin 64(5): 264-265. Khallouki M, Arib S, Samkaoui MA (2012) Postobstructive pulmonary edema. Rev Pneumol Clin 68(1): 63-64. Mehta KK, Ahmad SQ, Shah V, Lee H (2015) Postobstructive pulmonary edema after biopsy of a nasopharyngeal mass. Respir Med Case Rep 16: 166-168.